There is no arguing that coal has an important role in Australia’s economy – past, present and future. We are not trying to destroy the coal industry. We are merely fighting for the future of agriculture, an industry which has worked hard for and earned similar significance in Australia’s economy – and which is seriously threatened on the Liverpool Plains by proposed projects at Caroona and Watermark. In April 2006, the NSW State Labor Government issued BHP Billiton, via its shelf company Coal Mines Australia Ltd, a five-year coal exploration licence EL 6505. BHP paid the government $100m for the licence with the promise of an additional significant contribution from BHP if approval to mine is granted. The exploration licence covers 344 square kilometres around Caroona in the Liverpool Plains region of NSW – recognised as one of Australia’s most productive food bowls, contributing $332m to annual GDP. BHP Billiton plans to lodge their Environmental Impact Statement (EIS) in early to mid 2015. Although the company has promised not to long wall mine under the alluvial acquifer or the black soil plains, the proposed project still holds a number of significant concerns with regard to water and natural resources. In August 2008, the NSW Govt issued an exploration licence over neighbouring land at Watermark to the Chinese State owned miner Shenhua. The company paid the NSW Government $300m for the right to explore 195 square kilometres for coal with a promise of a further $375m if approval to mine is granted. Shenhua lodged their Environmental Impact Statement (EIS) on October 29, 2012 and it was on public display from February 28 to April 26, 2013. The NSW Government and mining companies say they believe there is an untapped coal reserve in excess of 500 million tonnes within the licence area which would support a 30-50 year mine. Shenhua Watermark is seeking State Significant Development Consent under Division 4.1 of Part 4 of the Environmental Planning and Assessment Act 1979 for the development and operation of an open cut coal mine for a period of 30 years. According to Shenhua Australia: The Project is located approximately 25 km south-east of the township of Gunnedah and to the immediate west of the village of Breeza. The Project is approximately 282 km by rail from the Port of Newcastle. o Communications and electricity infrastructure. • A workforce of up to 600 full-time equivalent employees during construction and an average of 425 full-time equivalent employees during the operation of the Project. The Liverpool Plains are an area of world class agricultural production and value. The soils and climate are second to none and proximity to market gives the area a competitive advantage. The region is possibly the most drought resistant broad acre farming area in Australia, and when faced with food security issues in a time of global climate uncertainty, the area needs to be protected for its productive significance. The people of Australia should not be alienated from their ability to produce food. The region is underpinned by vast coal and gas resources. The extraction of these resources poses a serious threat to the productive assets which reside above the ground via disturbance both underground and across the system. The black soil plains rely on the sloping country to deliver moisture and nutrients in wet times. Disruption of only the sloping country will not necessarily preserve the flat black country to its current capacity. Subsidence under flood plain country will certainly upset water flows and the balance of the water system. Once the infrastructure is in place for the development of one project, it is likely that the proponents will have an incentive to extract further resources from the area so any talk of the effects of mining must be considered in this context and the effects of the initial project cannot be downplayed. A final void will remain in the Western Mining Area and will cover an area of approx. 100 hectares. It will have a maximum depth of 80 metres below the natural ground surface…. The analysis found that partial backfilling of the void would incur a total additional cost of $42 Million, whilst complete backfilling would incur an additional cost of $438 Million… Therefore, in recognition of the further potential coal resources and the ability of the Western Mining Area void highwall to provide access to these resources, the cost / benefit analysis found that the retention of a safe and stable final void in the Western Mining Area was the most appropriate outcome. Claims that this is a one off project which will not incur future interference with the natural and current environment are clearly misleading. Unfortunately we just cannot take the goodwill claims of these companies at face value, and consequently we are committed to ensuring the protection of the resources in our beautiful region from the outset. Coal is a variety of solid, combustible, sedimentary, organic rocks that are composed mainly of carbon and varying amounts of other components such as hydrogen, oxygen, sulphur and moisture. Coal is formed from vegetation that has been consolidated between other rock strata and altered by the combined effects of pressure and heat over millions of years. Many different classifications of coal are used around the world, reflecting a broad range of ages, compositions and properties. Australia is the world’s leading coal exporter. Whether this is something to be proud of in the face of climate change is questionable. Coal burning is the single biggest contributor to climate change. Australia’s coal took 225 million years to form. At the current rate, it will have taken less than 300 years to extract and burn it all. Climate change aside, the burning of coal releases pollutants into the air which are harmful to people and harmful to the environment including waterways. 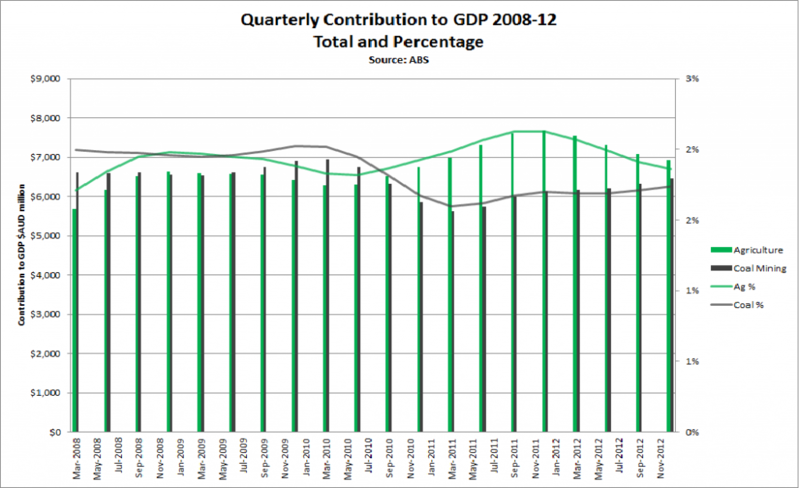 Coal and agriculture are comparable contributors to the Australian economy in terms of GDP, with agriculture slightly in front. 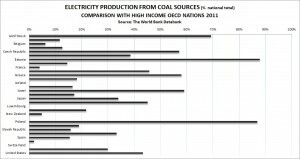 The importance of coal to the Australian economy is often advertised by the industry. It could be said that the industry’s ‘bark is bigger than its bite’. Indeed, the mining as a whole makes up a figure close to 10% of GDP, however it must be noted that this is not coal alone. Australia produces almost 70% of its electricity from coal sources, a figure which makes this nation significantly behind in meeting GHG targets of the Kyoto Protocol and a poor performer when compared with other high income OECD nations. 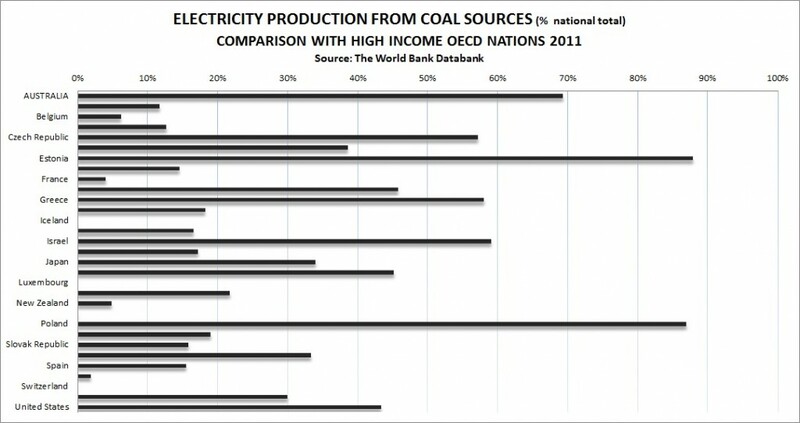 Coal is an important source of energy in Australia – much more so than in many other developed nations. As shown in the below graph, Australia produces almost 70% of its electricity from coal sources – a figure which is outdone by only Estonia and Poland. 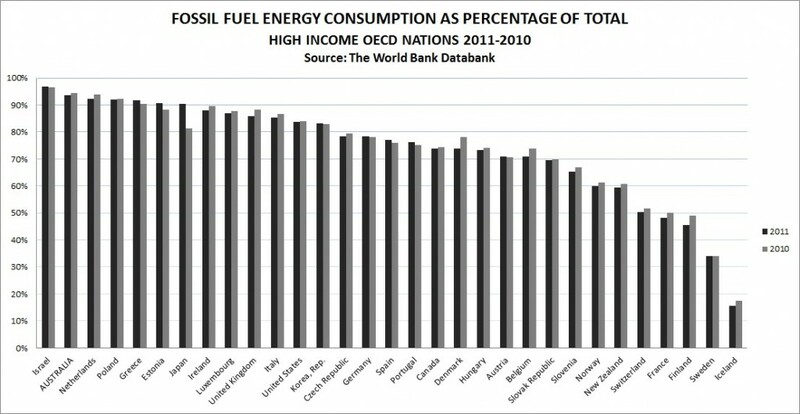 Furthermore, when energy consumption is considered more broadly, Australia is still leading the way in terms of fossil fuel consumption in comparison to our counterparts. Australia’s abundance of coal does indeed make coal fired power stations the cheapest to operate locally. BUT, the environmental costs of coal fired power stations have yet to be adequately accounted for in the figures of Australian electricity production. There is no such thing as clean coal. Although carbon capture and storage is developing, the technology is far from the required deployment level to keep CO2 emissions at acceptable levels. Current production costs of coal fired power stations do not adequately include environmental and health externalities which WILL cost this nation in the future. Coal-fired power plants have much wider reaching effects than that of climate change. Australia has one of the highest CO2 emissions on a per capita basis in the world. Burning coal is a relatively inefficient method of electricity production which emits a variety of pollutants other than CO2 including mercury, arsenic, dioxin, and sulphites. Carbon capture and storage reduces the efficiency of a coal fired power plant even further. The longer we rely on coal for energy, the further we fall behind other developed nations in the introduction of clean energy sources and green jobs. We are being proactive about protecting our health and welfare from coal mining. We want to understand the affects this industry will have on us before they may occur. That is why community groups and organisations in the Gunnedah Basin are commissioning a Gunnedah Basin Health Impact Assessment (HIA). There are clear indications from international health research literature that there are serious health and social harms associated with coal mining and coal‐fired power stations for people living in surrounding communities. 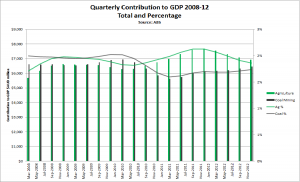 The Health Factor Report – Ignored by industry, overlooked by government. In May 2013 Doctors for the Environment Australia released The Health Factor Report outlining the potential health effects on communities across Australia from coal and coal seam gas projects. This report describes the failure of governments and resource companies to protect human health. It reveals cases where coal projects have been allowed to pollute at levels known to compromise human health and where inadequate monitoring of air quality disguises the dangers. The report describes how cardio-respiratory and other diseases in nearby communities are likely to be caused or exacerbated by pollution from coal mining and transport. The Health Factor reveals the costly legacy unfolding for Australia from under-regulation of the pollution caused by many resource projects. The report advocates for health impact assessments to be a mandatory part of the approval processes for any polluting industrial project. The purpose of this report, released in October 2012, is to provide an objective overview of the available international and local evidence from the health and medical literature about the health effects and social justice impacts of coal mining on local communities and to discuss and relate these issues to the Hunter Region of New South Wales.